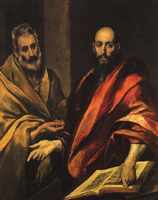 Apostles Peter and Paul c.1592 Greco, El , c. 1541?1614, Greek painter in Spain, b. Candia (Herakleion), Crete. His real name was D..
Christ c.1590. 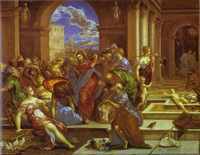 Greco, El , c. 1541?1614, Greek painter in Spain, b. Candia (Herakleion), Crete. His real name was D..
Christ Carrying the Cross Greco, El , c. 1541?1614, Greek painter in Spain, b. Candia (Herakleion), Crete. His real name was D..
Christ Driving the Money Changers from the Temple Greco, El , c. 1541?1614, Greek painter in Spain, b. Candia (Herakleion), Crete. His real name was D.. 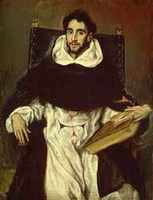 Fray Hortensio Felix Paravicino Greco, El , c. 1541?1614, Greek painter in Spain, b. Candia (Herakleion), Crete. His real name was D..